SANTEE – The Christian High Patriots became the first team to 2-0 at the Armstrong Memorial Horsman Automotive Tournament, knocking off Mt. Carmel, 60-45, on Friday night at West Hills High School. The Patriots, who improved to 3-2 overall, started the game off fast, sprinting to an early 10-0 lead midway through the first period through fast break layups and big dunks. The Patriots extended the margin to a 17-4 lead and led 21-10 after the first quarter. Christian High’s 6-foot-7 senior wing JACKSON LARSEN had six points in the first quarter and finished with 22 points, 11 rebounds and two blocks. 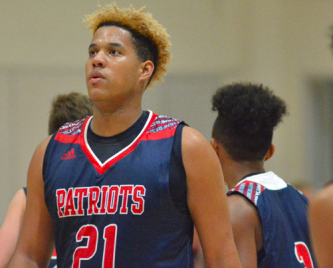 The Patriots got some help from an unexpected source in senior CAMERON DEJESUS, who beat up the interior on his way to eight points, 13 rebounds and three assists. What surprised many was watching the 6-foot-5, 220-pound DeJesus run rim-to-rim for not only rebounds but also tip-outs, which created numerous second-chance opportunities for the Patriots. Junior point guard MILES WILLIAMS put together a solid stat line with seven points, 11 assists, four rebounds, and five steals, with just one turnover. Christian led 29-20 at halftime. The Patriots appear to be on a string on defense, often feeding off the energy of one another while boxing out, taking charges, and winning the hustle plays. Junior DASEAN LYNCH continues to excel, according to CHS head coach DAVION FAMBER. “DaSean has been shooting 50-plus percent from the floor, 40 percent from distance while still hitting free throws at a very high clip of 80 percent,” Famber said. The Patriots look to remain hot going into a Dec. 1 game versus former League foe Coronado here at the event. The game starts at 7:30 p.m. The Islanders are 0-1 in the tournament, losing the Mt. Carmel, 34-29, last Tuesday.